Michael Roy, former Director of Academic Computing Services at Wesleyan University, served as my formal advisor for this project. He provided several very useful suggestions on the design for this web site. In the fall semester of 2000, he taught a graduate course on "Reading and Writing Hypertext," which provided me an overview of the literary theory of hypertext, along with the examination of many examples of web sites and hypertext. That course gave me the opportunity to develop my first web site, which covers the history of the Friendship Dolls exchanged between Japan and the U.S. in 1927 and more recent years. Ellen Schattschneider, Assistant Professor of Anthropology and Director of Graduate Studies at Brandeis University, also served as advisor for this project. I want to acknowledge her valuable suggestions on my project proposal, web site organization, and approach to the topic. During 2003-4, as a Fulbright scholar, she conducted research in Japan on memories of the Pacific War, especially on the kamikaze. She is finishing her book on Facing the Dead: Japan and its Dolls in the Mirror of War, which examines the significance of dolls in popular Japanese experiences and memories of World War II. The following web page discusses her research interests: Studying the Anthropology of Women and Religion in Japan. 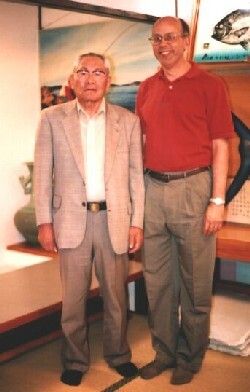 Senri Nagasue, former member of the Kamikaze Special Attack Corps Yashima Unit and author of several books on kamikaze, provided invaluable support for this project. He made all of the arrangements for me to meet with his classmates and others in the Imperial Japanese Navy, most of whom are former members of the Kamikaze Special Attack Corps. During my 2004 trip through Japan, these men escorted me to museums and monuments, told me about their wartime experiences, and gave me books and other valuable written information related to Japan's kamikaze operations. These men include Sunao Azemoto, Yoshitaka Fujioka, Akira Fujishima, Mototsugu Gotoh, Shigeo Gotoh, Keiji Hada, Saneyuki Hida, Kenya Hiraoka, Tetsumi Hirashima, Ryoichi Iimori, Kiyoshi Iwamoto, Shoji Jikuya, Noriaki Kamura, Ryohei Kawakaze, Toshimitsu Kijima, Tatsuya Koizumi, Iwao Miura, Hiroshi Nagata, Toshiyuki Nagahama, Masatoshi Ohsugi, Kesaharu Ohta, Tamori Ono, Masaru Satoh, Shoji Sugiyama, Katsumi Suzuki, Noriaki Tamura, Moriji Tsuruta, Shoichi Tsutsui, Toyokazu Uchikoshi, Isao Uchiyama, Teruhiko Yamada, Seizo Yasutake, and Masami Yukitoki. Senri Nagasue also arranged meetings with the following family members of kamikaze pilots who died in the war: Shigehiko Fukuda, Masatoshi Kirihata, Taeko Kumamoto, and Masako Narazaki. I greatly appreciate Senri Nagasue's answers to my e-mail questions, advice on my web site, and permission to translate stories and letters on his web site. The following museums have kindly provided permission to use materials on this web site: Chiran Peace Museum for Kamikaze Pilots, Etajima Museum of Naval History, Hotaru Museum, Kaiten Memorial Museum, Kanoya Air Base Museum, Bansei Tokko Peace Museum (formerly known as Kaseda Peace Museum), Mizobe Town (Kokubu No. 2 Air Base Exhibit), and Yokaren Museum in Oita City. Several museum directors and employees provided valuable assistance, including Muneshige Fuchigami, Shoichiro Hatakeyama, Noriaki Kamitomo, Haruhiro Inoue, Kiichi Kawano, Takeshi Kawatoko, Takumi Takamatsu, Shizuya Tanaka, and Hatsuyo Torihama. I want to especially recognize the help of Sachio Matsunaga, Kanoya Air Base Museum Director, who took me by car to several places inside the base not normally accessible to visitors. Gene Brick of the Drexler Survivors Reunion Association has provided valuable assistance for several articles included on this web site. My sincere appreciation also goes to the following other members of the Drexler Survivors Reunion Association: Bob Anteau, Red Brantley, Bartt Brick, Sam Brick, Charlie Brown, Henry Christiansen, Joe Curgino, Joe Haas, Robert Hunt, Bob McIntyre, Fred Mitchell, Duke Payne, and Roseann Viola. Yuko Shirako deserves a special thanks for her contributions of materials for this site, insights into Japanese views about kamikaze, and answers to my many questions. The following individuals and organizations have provided materials, suggestions, and other valued assistance for this web site: Yuki Akiyama, James Bond, Mel Brown, Wayne Brown, Rev. C.H. Cooper, Bob Cooper (USS Callaghan Survivors Association), Dr. Rex Davis, Daniel Dizon, Kevin Gordon, Johnnie Johnson Hafernik, Fumiko Hattori, Isako Imamura, Seiichi Inoue, Leo Jarboe (USS Callaghan Survivors Association), Barry Joseph, Shingo Katayama, Daniel A. Kitchen, Aya Koda, John Laughton, Steve Laughton, Jim Long, Risa Morimoto, Mieko Morita, Masato Muranaga, Emiko Nagayama, Kanako Nakayama, Shinobu Nishida, Kimie Nutahara, Kensho Ohta, Constance O'Keefe, Jim Owens, Kenji Sekiyama, Kan Sugahara, Yusushi Takahata, Tony Teal, Stephanie Vandrick, and Hisahide Yamamoto. Their kind support for this collaborative project is very much appreciated. The Chiran Speech Contest Committee and Yuko Shimaki coordinated getting permission to publish English translations of speeches from the following former contest prize winners: Hiroyuki Beppu, Rimi Hamasaki, Rika Imahori, Hideki Jinnai, Ai Kamisono, Tomoyo Kawasaki, Tomomi Kimura, Sumio Koike, Nozomi Kuwashiro, Takao Nagasaka, Miki Nagatomo, Eri Nakahara, Shoko Nakama, Rina Natsusako, Hiromi Nomura, Kenji Ojima, Masako Suzuki, Ayaka Tanaka, Ayumi Tominaga, Mitsuo Yamamoto, and Noe Yonamine. My deepest gratitude goes to my wife Noriko for her loving support. I appreciate very much her checking the many Japanese e-mails and letters that I wrote as part of my research for this project. Without her backing and understanding, this work could not have been completed.